Another card hoping that I’ll get picked for the 2S4Y design team. Pretty please! I channelled my inner Debbie Olson for this card. I do wish I had used a smaller scalloped edge for the dark purple DP but oh well, I didn’t have enough left to redo it. It is still pretty I think. The focal point uses JustRite stamps using Nestabilities to cut out the outer and inner circles. I stamped the little words and the initial together twice on both the light green DP and the ivory CS. 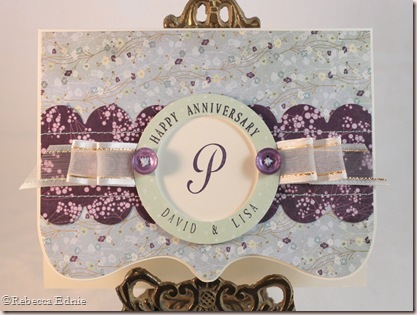 Unfortunately, when I layered the papers, the Happy Anniversary on the ivory layer could still be read fron underneath the green layer when the card was at an angle! Ooops! So I used the same Nestabilities to cut a ring of foam dimensional from a sheet I got from Jody Morrow. Now with the foam underneath, you can’t see it! Another save! Soooo pretty!!!! Love the colors!! !